Our club records go as far back as we know and include records from our merged entities. They are as accurate as we know and may be corrected with future claims. The Committee will determine when we believe that they are stable and formally approved. If you believe you have bettered one of these, please submit the information via the form, including where we can substantiate your claim. The information will be automatically sent via email to the Committee for consideration. - For Juniors, we will cascade your record to older age groups if applicable. Events to be considered should be where you represented ANW, competed in the ANW uniform, in an AV / AA sanctioned competition whilst you were/ are a member of ANW. Electronic timing takes precedence where possible. Age Group records are based on your age on the day not the Competition Age Group. We aim to keep track of previous record holders where possible so our history of records is not lost. If you held a record that has been broken but not listed, please let us know. 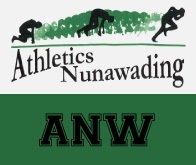 Thank you to Ken Cleaver for maintaining our Women’s Club Records, including those of the Nunawading Women’s Amateur Athletics Club, founded in 1965, and now merged into Athletics Nunawading. Thank you to Steve Vernal for maintaining our Men’s Club Records, including those of the Nunawading Amateur Athletics Club (now merged into Athletics Nunawading), and to Scott Bowden for finding the Mens Records to 2003. - none outstanding. Submit yours soon! but if you have bettered a Mens or Womens listed record, please let us know! if the claim betters the old record, adjusted for implement weight. the Mens Open events, so we didn’t have many U20 records. distance with a lighter implement that we would not recognize this as a record. * If you think you have missed out, then please submit your claim via the above form as soon as possible! Kyle Swan: U16-U20 5000m Walk at the 2015 Victorian Junior Championships at Albert Park - Victorian Record! may be records as well. With the wind blowing in his face, Jamie Stratton smashes his own club record in the Long Jump! 16 November 2013 - and still they keep coming! 2 November 2013: What a day for records! U16 300m Hurdles: Glen Vernal sets the record. Darci Hughes takes out a very old records for U19 and U20 400m from 1985! He still has the whole season to go to get more Pbs! Kyle Swan sets the record for the 2000mWalk. We had some good walkers a long time ago but no records set for U15 and 2000mWalk. Jamie Stratton smashes our long standing 100m Mens Open record held concurrently by 3 runners fro 1978 and 1994 but with no wind indicator (NWI) provided by White Zone, our Committee decided that the record could not be ratified. Brooke Stratton equals the long standing Womens Open and U20 Long Jump record held by Peta Kennedy in 1992. Hana Basic breaks our U18 and U19 200m record in winning the U18 Australian Junior title. The previous record was set way back in 1990 by Peta Kennedy. Chloe Beovich takes our U14, U15, U16 and U17 3kg Hammer record with 27.28m and our U14/U15 Shot Put at the Australian Junior. Jamie Stratton takes Gold with a huge 7.41m in Long Jump. His sister Brooke keeps Gold in the family in Long Jump but not with a club record. Jamie Stratton jumps 7.22m to be best for the Round at the refurbished BSAT track. If there were BSAT records his jump might have taken that record too. Jamie Stratton breaks the 400m record set on the 4th of February this year by Adrian McLean. Jamie’s run of 49.50s just eclipsed Adrian’s time. A scintillating run! Kristy Stratton fires up in the cool of the evening to add almost 2 metres to her records, moving the U18, U19 Hammer out to 27.35m. What a day for Grazia-Inez Gallucci, Katarina Moesbergen, Brittany Burkitt, and Hana Basic!!! They took out the U18 Championship and the U18 and U19 State Records with 48.16s! Along the way the broke our club records in the heats (easing down says Wayne the coach) and in the Final the smashed our U18, U19, U20 of 49.3s and Womens Open record or 48.3s. In 34 degree heat, Kristy Stratton pushed her own record out to 25.55m in the U18 and U19 3kg Hammer. Not to be outdone, brother Jamie took out the long standing Mens Open 200m with another scintillating run. Kristy Stratton takes over the U18 and U19 3kg Hammer with 25.26m. The Medley Relays are being checked but these may be new events so new records for everyone to chase! Brooke Stratton smashes our old 1986 Triple Jump record of 11.43m held by another World Junior Athlete Peta Kennedy. At Doncaster on a beautifully warm day, Brooke jumped a huge 11.92m to find her way into our records. Kristy Stratton updates the new 500g Under 18 Javelin record with 29.88m. Melissa Webb takes the new U15 - U18 500g Javelin records. The new records are the result of AV changing the implement weight for Javelin to 500g from 600g. Regan Lamble smashed the Women’s Race Record held by Kerry Saxby-Junta by 9 minutes to win in 2h32m17s, putting her at #24 in the all time fastest times. David Brock obtained a World Junior Qualifier of 7180 points in the Australian Combined Events U20 Championship in Sydney. Along the way he also broke the U20 and Men’s Open Pole Vault records with a vault of 4.30m. Adrian McLean broke our Mens Open 400m record of 49.75s held by Norm Marshall way back in 1987. His time in Round 12 of the AV Shield was 49.60s. Coach John Murray was chuffed. David Brock broke a few. He also broke some during the AV Shield season. Steve’s updated list coming soon. See below for recent updates and here for pending claims to the records. If you have a query, please email and a Committee member will get in touch with you. Initial load of Mens records is up to 2003 plus known recent claims. Womens records complete. We’ve updated where known but expect more to come. Let us know if you want to claim. When you submit this form you will need to send the automatically generated email to the ANW Committee. Please include “Record Claim” as the Subject of the email to help avoid it being treated as Junk! Please be patient whilst we work to confirm it. If you have a problem with submitting this Form, please contact us. Claim Club Record - The information you provide will be automatically transferred to an email which you will then need to send to the Committee’s email address that is included.